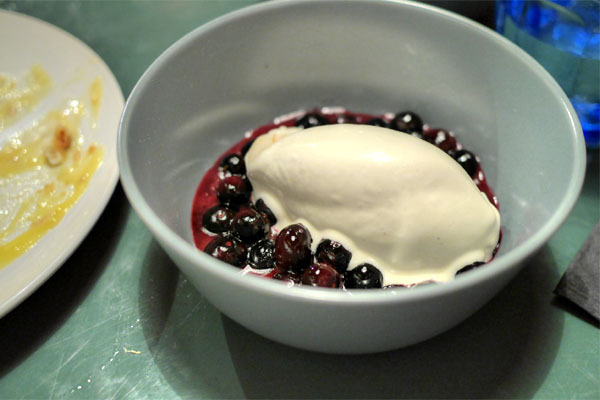 Back in February, we saw the return of David Féau to the LA dining scene. 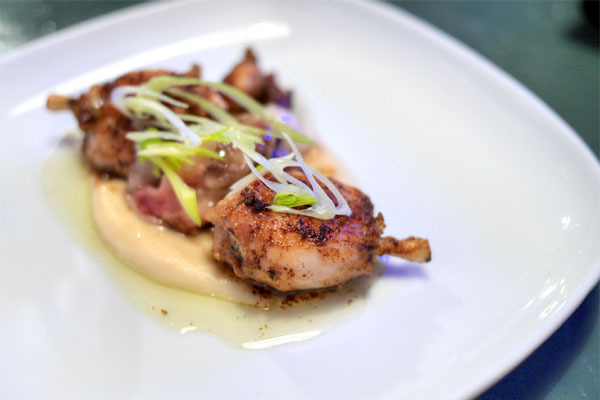 The Chef staged a three-week pop-up called Coin de Rue inside the old Red Medicine space in concert with Adam Fleischman. The series was largely well-received, and so he followed up with a second iteration (sans Fleischman as far as I could tell), which debuted on April 16th and ran until May 1st. 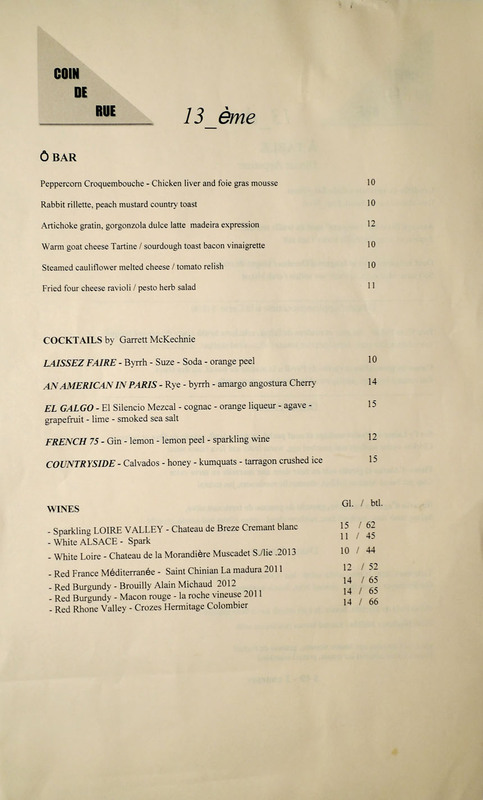 Michael J's in Chinatown was the setting for this incarnation, entitled 13ème after Paris' 13th arrondissement, home to the City's Chinese population. Inside, things were pretty cozy. They didn't really have any large tables (save for the communal hi-tops), so our party of six had to squeeze into a booth meant for four. It was workable, though certainly not preferable. 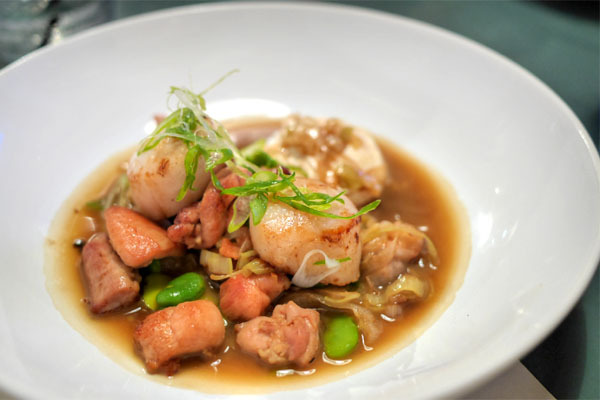 The Chinese-influenced menu for Coin de Rue 13ème centered around a three-course prix fix at $49 a head, which was joined by supplemental courses and some bar bites. 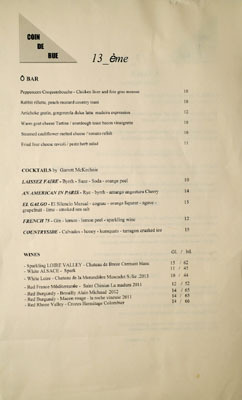 To imbibe, Garrett McKechnie (formerly of 1886 at The Raymond) had a few cocktails going, while wines were available by the glass or by the bottle. BYOB was definitely an option as well (which we clearly took advantage of). Click for larger versions. 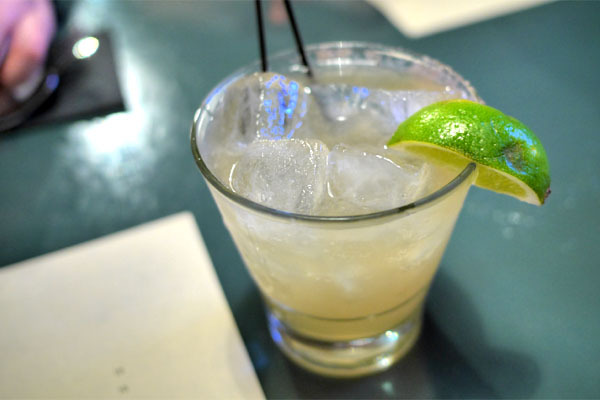 Given my penchant for mezcal, I had to get started with this. Think pleasantly smoky on the nose, and tasting of sweet-n-sour along with an overarching wisp of cognac heft. The croquembouches were a repeat from the last go around, though we weren't complaining. 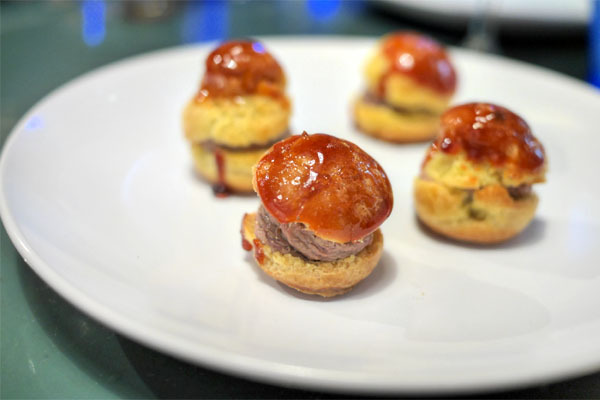 They were delightful little bites, sugary at first, with the heft of the liver coming in later, the whole thing accented by the crunch of that caramelized top. 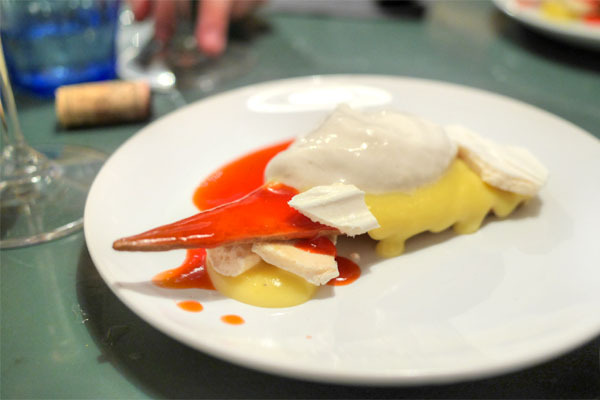 Next was quite possibly the most unconventional preparation of artichoke that I'd ever encountered. 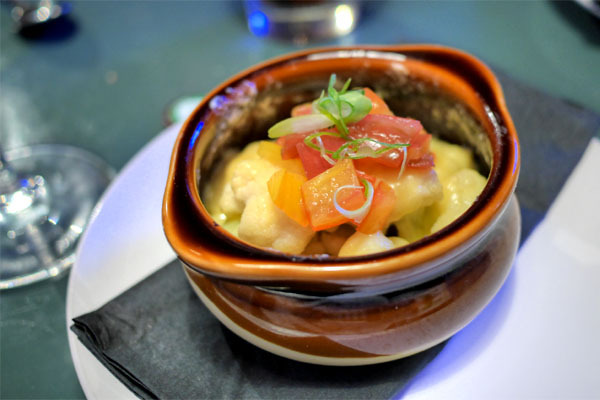 The star ingredient's light, vegetal flavors were forcefully conveyed, yet complemented by the pungent, piquant nature of the blue cheese while apples added some juicy crispness to the fold. 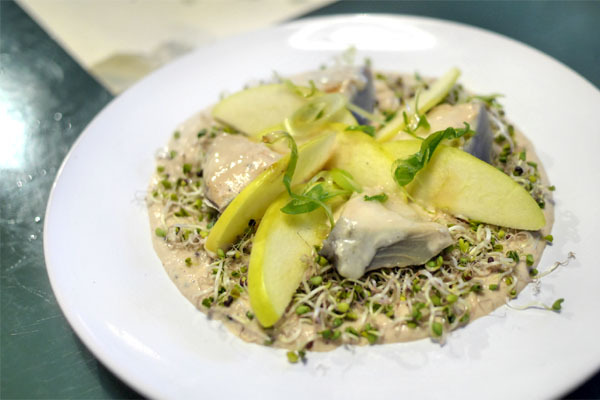 I really appreciated the sprouts here as well, which offered a zesty accent to the dish. 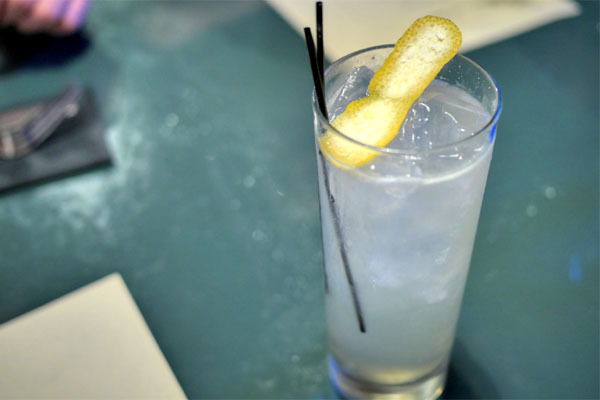 A pretty traditional French 75 was light and refreshing, with the lemon-y notes in the drink working well alongside the gin. What was interesting here was that there was a marked savoriness on the finish that I couldn't quite put my finger on. 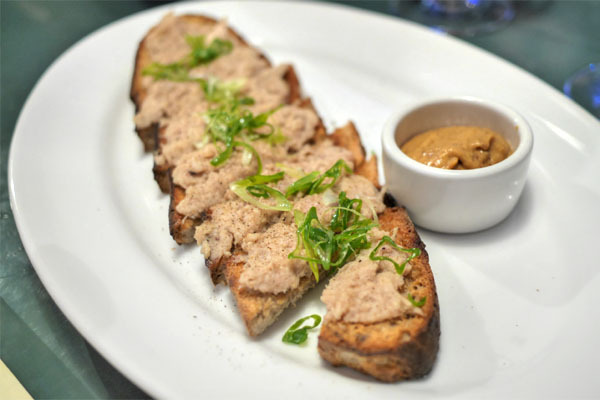 Rillettes were classic, really showing off the supple, savory rabbit while the mustard provided a sugary underpinning to the course. Superb texture on that crusty bread, too. The most whimsical of the bar bites (and probably my favorite), ravioli were encased in egg roll wrappers as an ode to the pop-up's Chinatown locale. 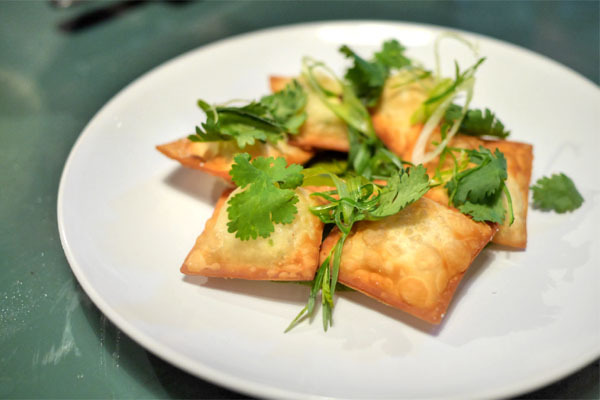 I loved the herb-y brightness here, which did a wonderful job counteracting the cheesy flavors at play, all while the egg roll casings imparted a fantastic Asian-y fried savor to the fray. 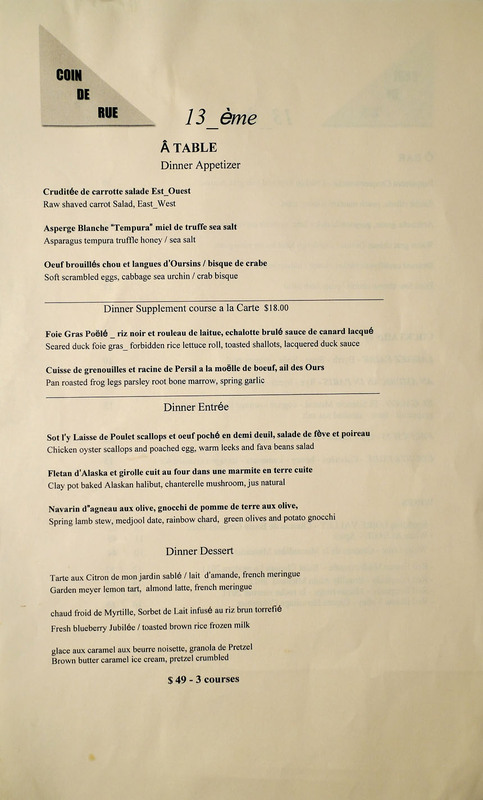 We BYOB'd it tonight for the most part, starting with the 1996 Henriot Champagne Brut Millésimé. 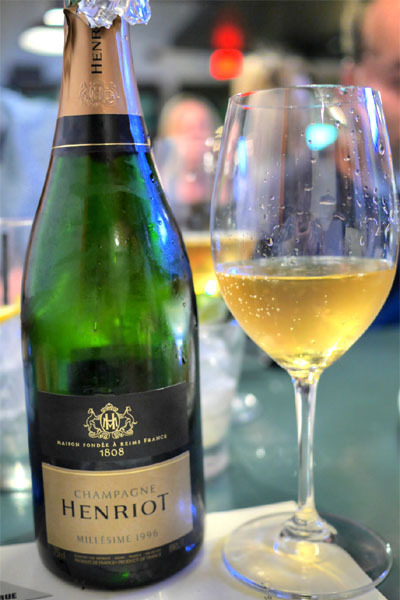 It was great to taste some aged Champagne for a change. This one still had plenty of effervescence to it, and boatloads of breadiness paired with a nice oxidative quality and some citric notes. Cauliflower was crisp and crunchy, and very subtly seasoned, so the cheese was key in providing the requisite amount of heft to the dish. Nice tartness from the tomato here as well. 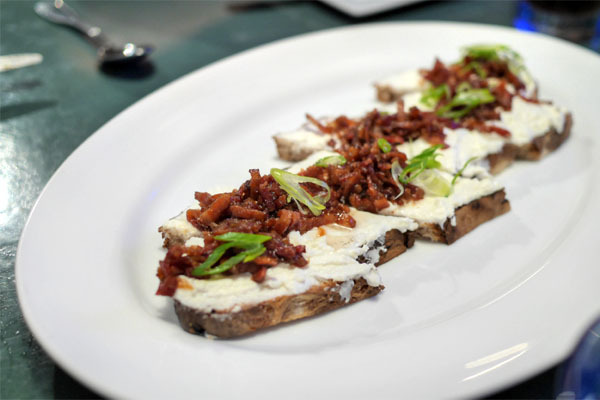 A goat cheese tart was on point, with the creamy, tangy chèvre providing the necessary lactic lushness to the dish while bacon imparted saltiness and savor. And again, wonderful texture on the bread. 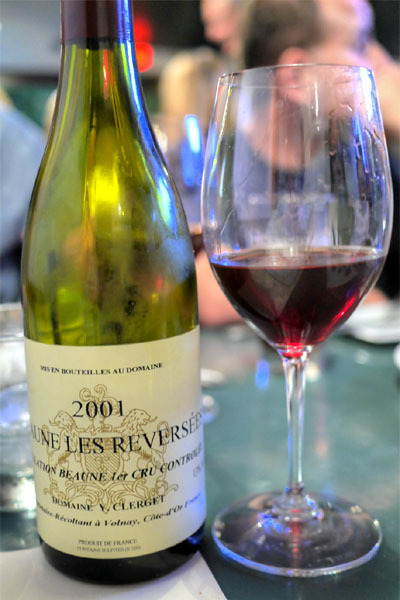 My favorite wine of the evening was the 2001 Domaine Y. Clerget Beaune 1er Cru Les Reversées. I found this earthy, acidic on the nose, while on the palate, I tasted tart, light fruit, spice, and a green, herbaceous edge. At this point we got into the evening's three supplemental courses. 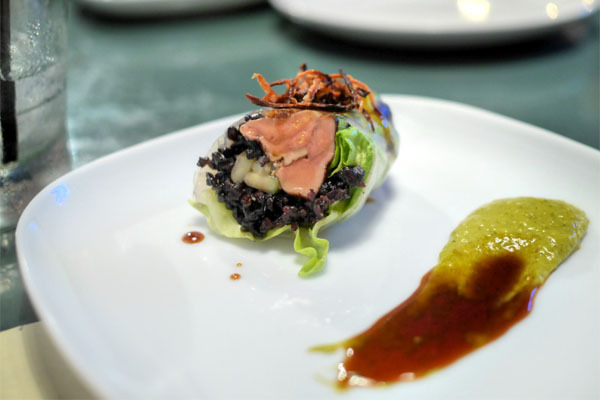 This first was impressive, and reminded us of Feau's foie gras barbeque lettuce wraps that we had at that epic 30-course foie dinner back in 2012. The richness, the potency of the silky, supple, seared liver was beautifully displayed here, moderated by the sticky sushi-like rice while cucumber provided a crunch and levity to things. Toasted shallots supplied a hit of savory astringency, and the close was all about that Peking duck sauce and its bittersweet finish. Definitely one of the highlights of the meal. Frog legs were perhaps a bit chewier than I'd like, but were spot on flavor-wise, with their briny edge nicely played against the slight sweetness and spring garlic present. The marrow, meanwhile, wasn't really necessary. 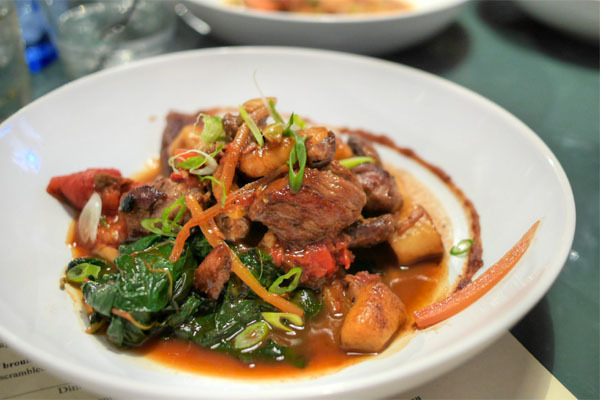 An off-menu special, the beef cheek was another standout, coming out super tender and showing off all the deep, dark, bovine flavors that you'd want, amplified by the dish's clear broth. 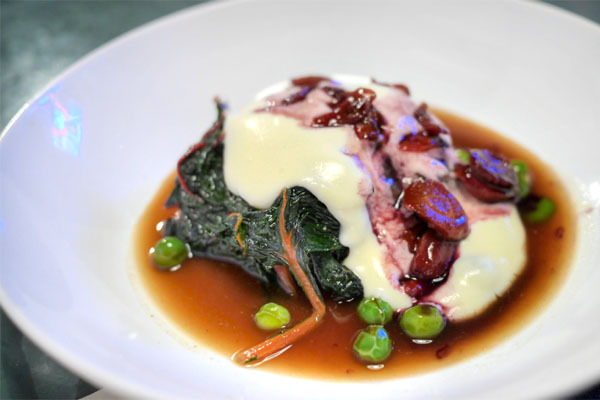 At the same time, the green chard was a welcomed touch, adding a great hit of counteracting bitterness, and I was a fan of the purple carrot and potato emulsion as well. Bordeaux time. 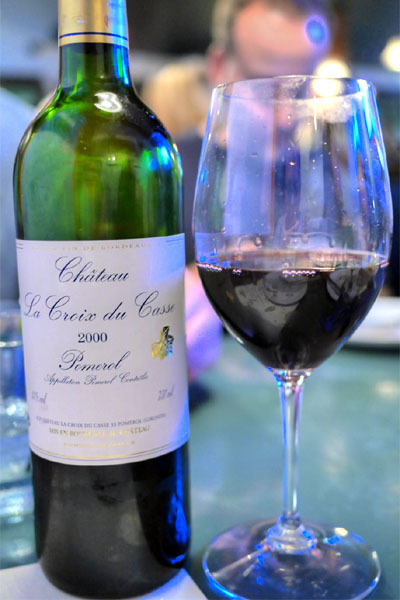 The 2001 Château La Croix du Casse was a potent wine, earthy and almost meaty in terms of bouquet, while on the tongue, I got notes of deep, dark fruit, tinged by a trace of mint. Getting into the prix fixe now, we commenced with certainly one of the most intriguing presentations of crudités I've had. 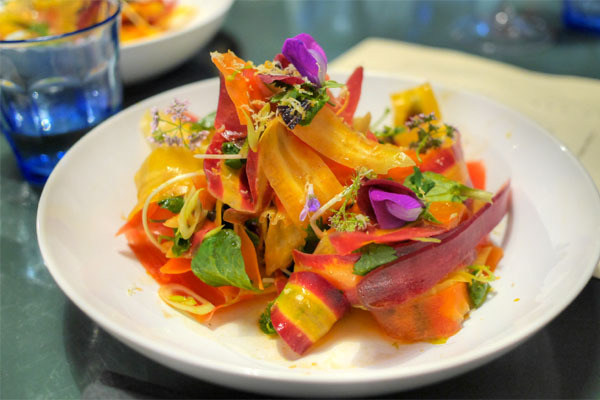 I loved the crisp texture on the carrots, and how their inherent sweetness was paired with all the bright, herby, citrusy nuances present. 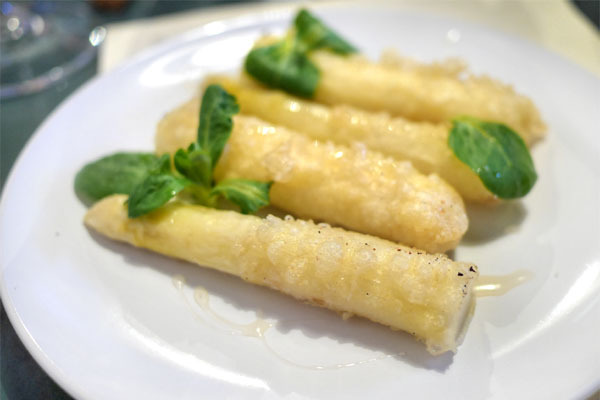 Another favorite of mine was the asparagus, made into some of the best tempura I'd ever tasted. I got an initial kick of truffle and sugary sweetness here, which then led to the crisp, bitter flavor profile of the meaty stalks of asparagus. Wonderfully light batter, too. 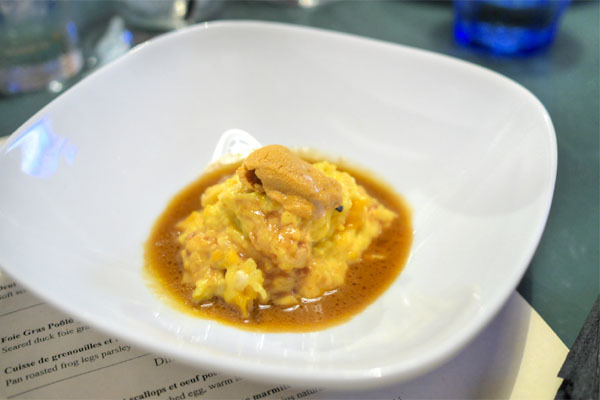 In another redux from the last pop-up, eggs and uni were paired together again in buttery, briny fashion, the crab bisque further amplifying the saline notes in the dish. Also key: the cabbage, which did all it could to provide a modicum of levity to things. Good, but not quite as revelatory as last time's. Scallops arrived well-textured and tasty, though they were outshone by the chicken oysters, which had a wonderful savoriness to them that paired swimmingly with the crunchy favas. A cozy, hearty sort of dish. 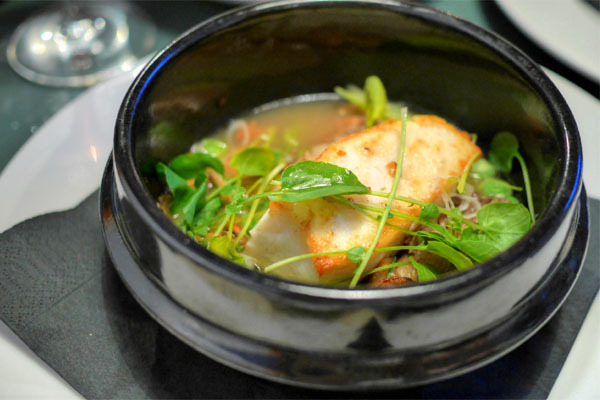 Halibut was soft and super flaky, with its delicate flavors augmented by the earthy chanterelles while the greenery up top provided just the right amount of brightness. Lovely. This was a homey course, with the lamb's rich, hefty flavors joined by the sweetness of date while the chard gave up a nice touch of bitterness. I liked the fluffy bits of gnocchi here as well, though my concern was that the lamb was a touch tougher than I'd prefer. 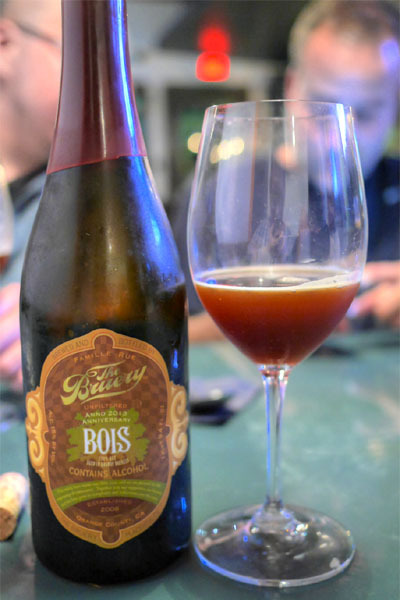 For dessert, we moved on to a beer, the 2013 The Bruery Brandy Barrel Bois. This was a doozy, unsurprisingly, with its nose of dark fruit, brown sugar, oak, and booze leading to more of the same on the palate, along with a tangy, vinous note from the brandy barrel-aging. A frozen milk of rice was sweet and creamy, but also conveyed a huge amount of sesame oil-like character that was rather unexpected. Those nutty notes actually paired pretty well with the sweet-tart berries, but I would've liked a bit more brightness here, maybe from some mint or some lime. A lemon tart was appropriately tangy, with its puckering qualities tempered just a smidge by the savoriness of that crust. Nice textures on the meringues. 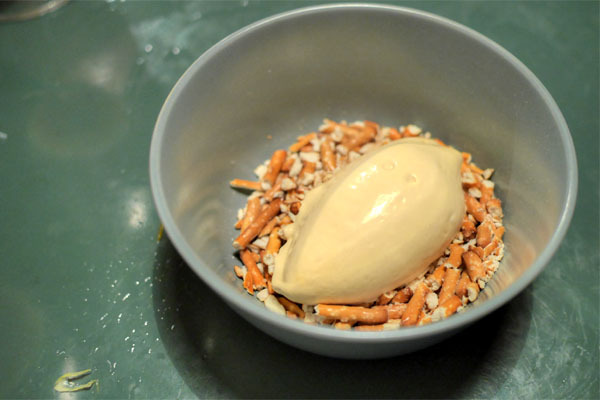 In my favorite of the desserts, ice cream showed off all the caramel-y, nutty flavors that you'd expect from brown butter, a sweet, but not overly saccharine presentation that melded well with the crunchy, salty pretzels. We all left 13ème very content with the food. 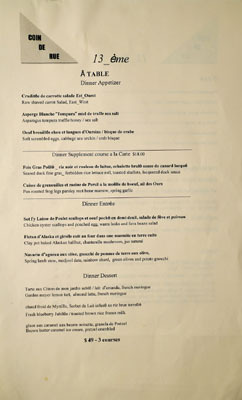 Féau did a commendable job here, surpassing the plates that he put out at the first incarnation of Coin de Rue. The incorporation of Asian influences was fairly subtle for the most part, but definitely seemed to jive with his French roots. In fact, it's a direction that I'd like to see him pursue further. When asked about his future plans, the Chef stated that he already has another location in the works, so I'll be sure to be on the lookout for that coming up.